It’s hard to imagine an America so entirely at war that every aspect of the economy is affected. Where GM and Ford stop making cars to concentrate on bomber planes and tanks. Where healthy young men all but disappear from civilian life. And where five of Hollywood’s top directors (along with multiple screenwriters, cinematographers, and even one studio head) left their mansions and high-paid jobs to join the army and make training and propaganda films. 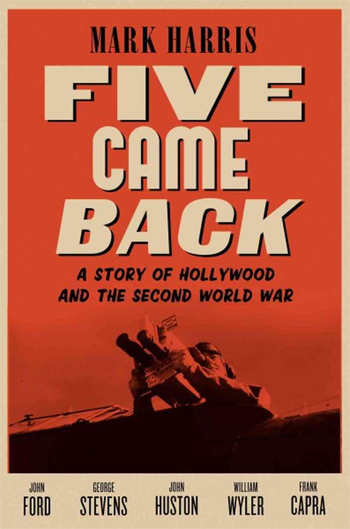 Last week, I finished Mark Harris’ new book, Five Came Back, where he describes the military careers of Frank Capra, John Ford, John Huston, George Stevens, and William Wyler. All but Huston were major, established directors when Pearl Harbor was bombed; Huston was an exciting new director who had just burst onto the scene. All of them would be changed by the experience. Harris also wrote Pictures at a Revolution: Five Movies and the Birth of the New Hollywood, which I reviewed back in 2011. The two books have a similar structure, chronologically weaving five slightly interconnecting stories about filmmaking and society. With this second book, Harris has become one of my favorite film historians. Capra had the easiest military experience of the five. Hollywood’s most popular and successful director through much of the 30s, his star was beginning to wane (according to Harris) by the early 40s. He spent most of the war stateside, producing and sometimes directing his Why We Fight and Know Your Enemy series, made up from old newsreels and other existing footage. The closest he came to combat was a few months in London, when the Germans were still regularly bombing that city. By contrast, Stevens and Wyler (and to a lesser extent Huston and Ford) spent large portions of the war on the ground with troops or flying in bombers. 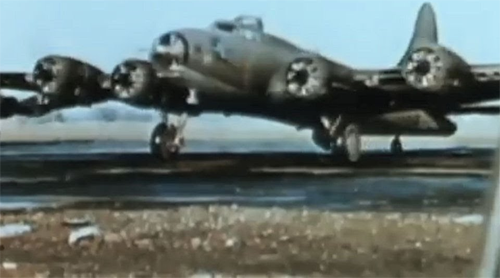 In what is probably the best film of the group (at least the best I’ve seen), The Memphis Belle: A Story of a Flying Fortress, Wyler films a bombing raid from inside a plane. The sense of flight and of danger are palpable. Wyler paid a lot for his patriotism. He lost all of the hearing in one ear and most of it in the other. But that didn’t stop him from making Roman Holiday, Friendly Persuasion (very much an anti-war movie) and Ben-Hur. Stevens lost something too, although it’s harder to define. He was with the troops that liberated the Dachau concentration camp, and spent his last months in the military documenting the atrocities. Before the war, he was known primarily for comedies. Afterwards, he stuck to drama. And Ford? Well, his politics swung from left to right over the course of the war. 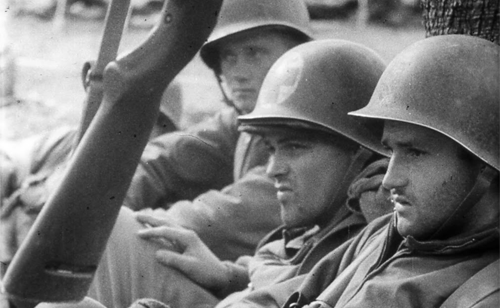 But my biggest surprise came with one of the most respected, and best, of the military films to come out of the war: Huston’s Battle of San Pietro. I had previously read that most of the picture was what we’d today call cinema vérité–footage shot of what was actually happening. The linear notes in the Treasures from American Film Archives collection says as much, and it certainly looks like it. But according to Harris, Huston arrived after the battle was over, and almost everything was faked. That it fooled so many people says a lot for Huston’s talent. Something struck me as I read this book, although Harris doesn’t hit on it. For their first film after returning to civilian life, four of the five made one of the best and most iconic pictures of their careers. Harris goes into detail about two of these–Capra’s It’s a Wonderful Life and Wyler’s The Best Years of Our Lives. (Despite the similar names, they are very different films.) The two he mentions only in passing are Ford’s My Darling Clementine and Huston’s Treasure of the Sierra Madre. Stevens, recovering from the emotional blow of documenting the Holocaust, took longer to get up to speed. Harris tells his stories in an easy-to-read style. Within the context of film history, he tells us a lot about how a struggle, now on the edges of living memory, that we could hardly even imagine today.